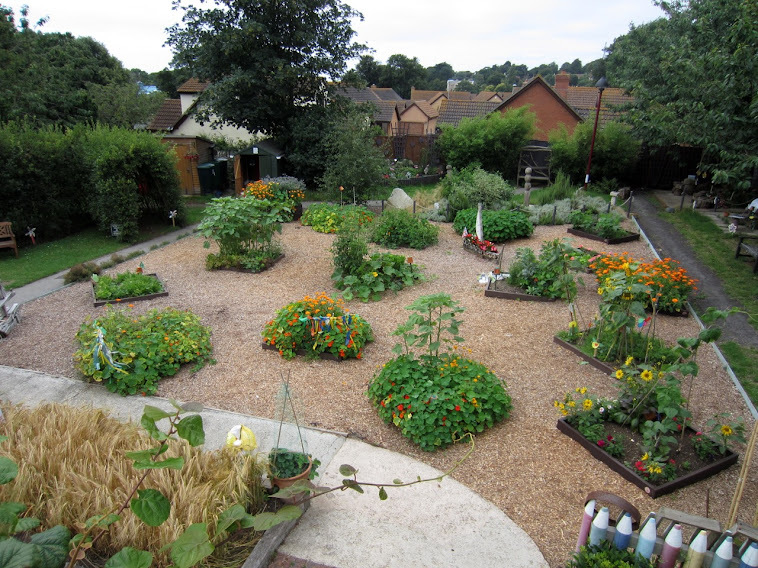 Holy Trinity Primary School Environmental Garden: Enjoying the dragonflies..
"Do not speak unless it improves on silence"
This week's quote is taken from Tibetan teaching. During the week when the working party was taking a pause it was so calm and peaceful you could hear the clicking from the wings of the dragonflies feeding over the garden. 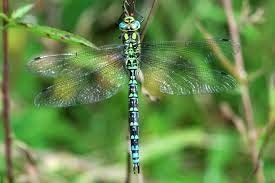 Three species of dragonflies were noted in the garden one afternoon recently - perhaps the most interesting one was the Southern Hawker. An irregular visitor to the pond but it has been seen egg laying there in previous years. In the bee nesting box many of the Red Mason Bees have hatched but it appears that perhaps these boxes are not so good for the bees as spiders get inside them and spin cobwebs there and the newly hatched bees fly straight into the cobweb and fall prey to the spider. A design fault maybe but the bees deserve better than this. A modification will be considered. Elsewhere in the garden Mrs Davidson's fig tree has produced a lot of fruit in the first year. In the Jurassic Garden work on the path continues. The main run of the path leading into the ammonite shaped centre piece had been laid and secured. The recycled edging has proved to be a good choice and is very flexible. The posts which came with them are also very strong. The stubby posts work well in the very hard ground here! At one stage six lengths of edging were joined together to enable the garden group to get a good round curve instead of fixing one length to another. This required some considerable man-handling but luckily some visitors were only to pleased to help! The garden has also been visited on several afternoons recently by our friends next door in Highclere House who have enjoyed wandering around the garden and taking in the peace and quiet here.